The U.S. Navy has begun to formally test the operation of an F-35C stealth fighter intended to demonstrate fulfillment of the service's requirements, USNI News reported Thursday. Rear Adm. Dale Horan, who leads the F-35C integration office, said Wednesday that Strike Fighter Squadron 147 arrived on USS Carl Vinson to assess the aircraft's capacity to address the Navy's needs. 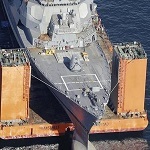 “We still need to see the aircraft configured in operational tests,” he said to the Northern Virginia Council of the Navy League, noting that the aircraft still lacks official reports. These operational trials follow the F-35C's involvement in a previous test with other aircraft on the USS Abraham Lincoln. 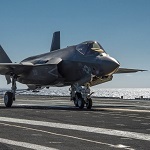 The vice admiral also stated that the Navy is taking a different approach in implementing the F-35C, given the aircraft's differences with other models. This involves working and training with the U.S. Air Force and U.S. Marine Corps on operating and maintaining the aircraft.